An environmentally friendly effort by many Torontonians has come with a hidden cost – a shrinking pool of money to guard against extreme weather. The growing use of products such as low-flush toilets, tankless heaters and efficient washing machines, combined with rising bottled water sales, has reduced local water consumption by 10 per cent since 2005, leaving Toronto with a projected $350-million loss in revenue from water utility bills over the coming decade. The result is that the city’s water division is facing a significant funding drop for critical infrastructure upgrades, at a time when extreme weather events are already severely taxing the region’s aging sewer system. The phenomenon was thrown into sharp relief this week as a record deluge created flash floods and dumped enormous volumes of polluted water into Lake Ontario. The city has been down this road before. After the 2005 storm, the city’s water infrastructure division spent hundreds of millions fortifying creek banks against flood-related erosion, rebuilding a washed-out segment of Finch Avenue, and digging huge storm-water holding tanks in areas that saw heavy basement flooding due to backed up sewers. Among other things, the rains tore open a sewer main buried under Highland Creek and the resulting sewage spill destroyed $3-million worth of city equipment in a nearby works yard. Another heavy storm last summer destroyed three bridges along the Don River tributaries. 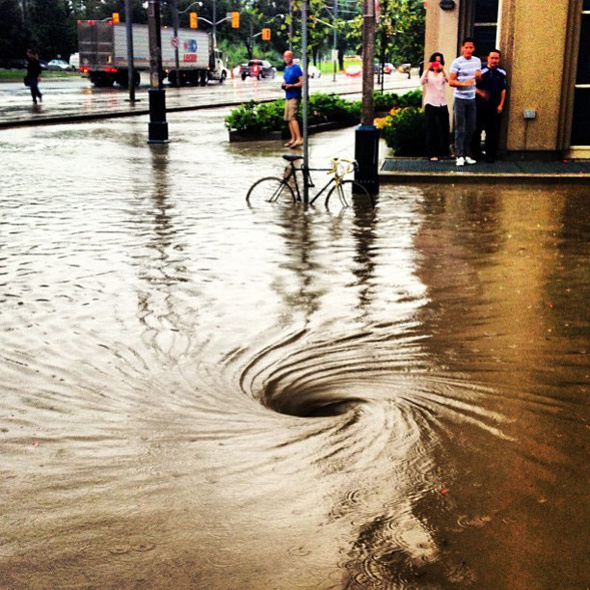 The 2005 downpour, like Hurricane Hazel in 1954, was considered a “100-year” storm, meaning the likelihood of a repeat next year is 1 per cent. But Monday’s deluge marked the third such extreme weather event in just over 60 years. After amalgamation, the new city faced huge hurdles relating to aging water mains and combined sewer outflows that contained both storm water runoff and raw sewage. City beaches were all but unusable because in heavy rains, the sewage treatment plants couldn’t handle the volumes, with the result that millions of litres of untreated waste water ended up in Lake Ontario. Just before the end of mayor Mel Lastman’s term, council approved the so-called “wet weather flow management master plan,” which laid out a 25-year, $1-billion program of projects such as downspout disconnect programs, new emergency holding tanks and naturalized storm water ponds, all of which are designed to make the city somewhat more absorbent during heavy rain. Ms. Davis said much of the planned wet-weather project spending has been delayed indefinitely.